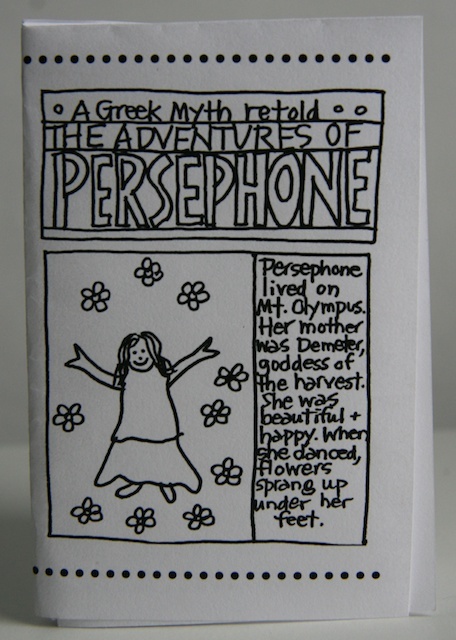 Celebrate the beginning of spring by making a little book of the Greek myth of Persephone. I first made this book for Multicultural Books To Make and Share and included it in Handmade Books For A Healthy Planet. For the section on books from the Americas, I considered the comic book as the book form of popular culture and made the connection between today's superheroes and the Greek gods and goddesses. All you need is the printed page and a pair of scissors. If you don't have scissors handy, you can tear the paper. Make a Hot Dog Booklet. The writing should be on the outside when you make the first fold.